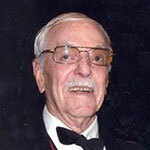 Sad News | Oldest NMRA Member Ben Marshall passed, 09/08/13, after a brief illness. Ben was inducted into the NMRA Hall of Fame in 2011 and will be missed by all of us in the racquetball community..
A comprehensive obituary reports that he was commissioned as a 2nd Lieutenant through ROTC, entered the US Army immediately after graduation and joined the 9th Infantry Division at Ft. Bragg, North Carolina; later transferring to the US Army Air Force for pilot training. He served as a fighter pilot until his separation from the service in 1946. From 1946 until January 1951, he worked as a baker and production manager for Marshall’s Electric Maid Bakeries in Mobile. Ben re-entered the service as an Infantry Captain assigned as an Assistant Professor of Military Science and Commandant of Cadets at Marion Institute. His next assignment was with the 24th Infantry Division in Korea. Throughout his Army career, Ben served in Command and Staff positions in the U.S., Europe and the Far East, including the command of a battalion in Germany and a tour in Vietnam in 1966-67. He retired as a Regular Army Colonel from Ft. Polk, LA in June 1973 and in 1986, retired from the baking business. He and his wife, Carolyn, moved to San Antonio, where Ben became an avid racquetball player competing in tournaments all over the country.